The Hart Memorial Trophy, originally known as the Hart Trophy, is awarded annually to the "player judged most valuable to his team" in the National Hockey League (NHL). The original trophy was donated to the league in 1923 by David Hart, the father of Cecil Hart, the longtime head coach of the Montreal Canadiens. The Hart Trophy has been awarded 92 times to 56 different players since its beginnings in 1924. Each year, members of the Professional Hockey Writers' Association vote to determine the player who was the most valuable to his team during the regular season. The Hart Memorial Trophy is named in honour of Canadian Dr. David Hart. Dr. Hart, who donated the original trophy to the NHL, was the father of Cecil Hart, a former Coach and General Manager of the Montreal Canadiens. The trophy was first awarded at the conclusion of the 1923–24 NHL season to Frank Nighbor of the Ottawa Senators. The original Hart Trophy was retired to the Hockey Hall of Fame in 1960, and the NHL began presenting a new trophy, which was dubbed the Hart Memorial Trophy in its place. With the exceptions of Tommy Anderson, Al Rollins, and José Theodore, every eligible player who won the Hart Trophy (and retired) has been inducted into the Hall of Fame. Wayne Gretzky won the award a record nine times during his career, eight consecutively. He has been named MVP more times than any other player in the history of the other three North American major professional leagues (Major League Baseball (MLB), National Basketball Association, and National Football League). Barry Bonds is second, having won the MVP award seven times in the MLB. Gretzky and his Edmonton Oilers teammate Mark Messier are the only players to win the Hart Trophy with more than one team. Players from the Montreal Canadiens have won the award sixteen times; players from Boston Bruins are second with twelve winners, while the Edmonton Oilers have seen players win the award ten times. Joe Thornton became the only Hart Trophy winner to have switched clubs during his winning campaign during the 2005–06 season, having played for both the Bruins and San Jose Sharks that year. The defenseman with the most trophy victories is Eddie Shore, who has four. By contrast, it is rare for a goaltender to win the award, which has happened only eight times in its history by 7 different goaltenders; Buffalo Sabres goaltender Dominik Hasek is the only two-time winner. The voting is conducted at the end of the regular season by members of the Professional Hockey Writers' Association, and each individual voter ranks their top five candidates on a 10-7-5-3-1 point(s) system. Three finalists are named and the trophy is awarded at the NHL Awards ceremony after the playoffs. The closest the voting for the Hart Trophy has ever come was in the 2001–02 season, when Jose Theodore and Jarome Iginla tied in the total voting. The tiebreaker for choosing the Hart Trophy winner in such a case is number of first-place votes: Theodore claimed it, who had 86 first-place votes to Iginla's 82. In 2008, the NHL's official online shop came under criticism after they placed a T-shirt advertising Alexander Ovechkin as the award winner on sale a week before the results were revealed. A spokesperson for the league said "in an effort to offer our fans the merchandise they want in a timely manner following an event such as the NHL Awards, our licensees prepare product for all possible outcomes. In this situation, the link for one of the possible products became live early through an error by our e-commerce provider." Ovechkin was later confirmed to be the winner. ^ The trophy was not awarded in the 2004–05 season due to the league's lockout. "Hart Memorial Trophy". National Hockey League. Retrieved July 11, 2014. Hockey Hall of Fame. "Legends of Hockey - NHL Trophies - Hart Memorial Trophy". Legends of Hockey. Retrieved July 11, 2014. "NHL Hart Memorial Trophy Winners". Hockey Reference. Retrieved July 12, 2014. Hollander, Zander; Bock, Hal, eds. (1970). The Complete Encyclopedia of Ice Hockey. Prentice-Hall Inc. ISBN 0-13-159905-4. ^ "Hart Memorial Trophy". Official website of Hockey Hall of Fame. Retrieved 15 February 2018. ^ Hollander & Bock 1970, p. 311. ^ "99 Reasons Why Wayne Gretzky is "The Great One"". National Hockey League. Retrieved January 1, 2012. ^ "Hart Memorial Trophy". National Hockey League. Retrieved July 11, 2014. Elwin Ira Rollins (October 9, 1926 – July 27, 1996) was a professional Canadian ice hockey goaltender who played for the Chicago Black Hawks, New York Rangers and the Toronto Maple Leafs. Aurèle Émile "Mighty Atom, Little Giant" Joliat (August 29, 1901 – June 2, 1986) was a Canadian professional ice hockey left winger who played 16 seasons in the National Hockey League for the Montreal Canadiens. Joseph Bernard André Geoffrion (French pronunciation: ​[ʒɔfʁjɔ̃]; February 16, 1931 – March 11, 2006), nicknamed Boom Boom, was a Canadian professional ice hockey player and coach. Generally considered as one of the innovators of the slapshot, he was inducted into the Hockey Hall of Fame in 1972 following a 16-year career with the Montreal Canadiens and New York Rangers of the National Hockey League. In 2017 Geoffrion was named one of the '100 Greatest NHL Players' in history. William Mailes "Cowboy" Cowley (June 12, 1912 – December 31, 1993) was a Canadian professional ice hockey centre who played 13 seasons in the National Hockey League for the St. Louis Eagles and Boston Bruins. Robert Marvin Hull, OC (born January 3, 1939) is a Canadian former ice hockey player who is regarded as one of the greatest players of all time. His blonde hair, legendary skating speed, end to end rushes, and the ability to shoot the puck at very high velocity, were all a part of the player known as "The Golden Jet". His talents were such that one or two opposing players were often assigned just to shadow him—a tribute to his explosiveness. In his 23 years in the National Hockey League (NHL) and World Hockey Association (WHA), Hull played for the Chicago Black Hawks, Winnipeg Jets, and Hartford Whalers. He won the Hart Memorial Trophy as the NHL's most valuable player twice and the Art Ross Trophy as the NHL's leading point scorer three times, while helping the Black Hawks win the Stanley Cup in 1961. He also led the WHA's Winnipeg Jets to Avco Cup championships in 1976 and 1978. He led the NHL in goals seven times, the second most of any player in history, and led the WHA in goals one additional time while being the WHA's most valuable player two times. He was elected to the Hockey Hall of Fame in 1983, the Ontario Sports Hall of Fame in 1997, and received the Wayne Gretzky International Award in 2003. In 2017 Hull was named one of the '100 Greatest NHL Players' in history. Herbert William "Buddy" O'Connor (June 21, 1916 – August 24, 1977) was a Canadian professional ice hockey centre who played for the Montreal Canadiens and New York Rangers in the National Hockey League. Christopher Robert Pronger ( or ; born October 10, 1974) is a Canadian former professional ice hockey defenceman who is currently the senior advisor of hockey operations for the Florida Panthers of the National Hockey League (NHL). He had not played since November 2011 due to post-concussion syndrome related to three separate hits suffered during his career; he also suffers from vision impairment due to being hit in the eye(s) by the blade of another player's stick. In October 2014, Pronger signed a contract with the NHL to assist its Player Safety Division. Originally selected second overall by the Hartford Whalers in the 1993 NHL Entry Draft, Pronger has played for Hartford, the St. Louis Blues, Edmonton Oilers and Anaheim Ducks before being traded to the Philadelphia Flyers before the 2009–10 season. He was captain of the Blues, Ducks and Flyers. He has appeared in the Stanley Cup finals with three different teams (Edmonton, Anaheim and Philadelphia), winning the Cup with the Ducks in 2007. Pronger won the Hart Memorial Trophy as the NHL's most valuable player for the 1999–2000 season, becoming the first defenceman to win the award since Bobby Orr in 1971–72. A mainstay on Team Canada, Pronger won Olympic gold medals at the 2002 and 2010 Winter Olympics and is a member of the Triple Gold Club. In 2017, he was named one of the "100 Greatest NHL Players" in history.Despite his skill as a player, Pronger was considered one of the NHL's "dirtier" players and was suspended eight times during his NHL career. Connor McDavid (born January 13, 1997) is a Canadian professional ice hockey centre and captain for the Edmonton Oilers of the National Hockey League (NHL). Considered to be the best player in the world by many colleagues and members of the news media, he was called the "most highly evolved hockey player of all-time" by The Sports Network in December 2017. Having been selected first overall by the Oilers in the 2015 NHL Entry Draft, McDavid has won the Art Ross Trophy twice as the leading scorer in the league, the Hart Memorial Trophy, given to the player judged most valuable to his team, in 2017, and the Ted Lindsay Award twice as the best player voted by other NHL players. McDavid grew up in the Toronto area and played hockey there, and was granted "Exceptional Player" status by Hockey Canada, which allowed him to play major junior one year early. He thus joined the Erie Otters of the Ontario Hockey League (OHL) and spent three years with the Otters before the Oilers selected him in the 2015 NHL Entry Draft. Internationally McDavid played for the Canadian national junior team at one World U18 Championship, two World Junior Championships, and for the senior team at one World Championship, winning one gold at every level. Ebenezer Robertson "Poker Face" Goodfellow, "Ebbie" for short, (April 9, 1907 – September 10, 1985) was a Canadian professional ice hockey player and coach. Goodfellow played in the National Hockey League (NHL) for fourteen seasons with the Detroit Red Wings from 1929 to 1944 as both a forward and defenceman. Goodfellow helped the Red Wings win three Stanley Cups, back to back in 1935–36 and 1936–37, and another in 1942–43. He was captain of the Wings for five seasons, including winning the first Red Wings MVP as a defenseman in 1939-40. He played on the team until 1942 when he was succeeded by Syd Howe as team captain. Goodfellow was the first Red Wing to have won the NHL's Hart Trophy (MVP) for the 1939–40 season. Goodfellow was the first Red Wing to receive this award and one of only four Red Wings in history to win the Hart; the other three being six-time winner Gordie Howe, Sid Abel (1949) and Sergei Fedorov (1994). After retiring from playing, Goodfellow coached in the American Hockey League (AHL) and later with the Chicago Black Hawks of the NHL. Elmer James Lach (, January 22, 1918 – April 4, 2015) was a Canadian professional ice hockey player who played 14 seasons for the Montreal Canadiens in the National Hockey League (NHL). A centre, he was a member of the Punch line, along with Maurice Richard and Toe Blake. 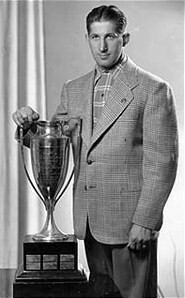 Lach led the NHL in scoring twice, and was awarded the Hart Memorial Trophy in 1945 as the league's most valuable player. He won three Stanley Cups with Montreal. When Lach retired in 1954, he was the league's all-time leading scorer and was inducted into the Hockey Hall of Fame twelve years later. His number 16 was retired on December 4, 2009, during the Montreal Canadiens centennial celebrations. In 2017 Lach was named one of the '100 Greatest NHL Players' in history. Guldpucken the (Golden Puck) is awarded annually to the ice hockey player of the year in Sweden. It is similar to the NHL's Hart Memorial Trophy. Normally it goes to a player in the Swedish Hockey League (SHL), the top-level ice hockey league in Sweden. It should not be confused with Guldhjälmen (the Golden Helmet), the award for the most valuable player according to the players in the SHL. This award has only gone to four players twice: Anders Andersson, Leif Holmqvist, Peter Forsberg, and Erik Karlsson. No player has won it three times. The sculpture Guldpucken is made by the Swedish artist Rune Hannäs. The term is most common in the United States and Canada. In other cases, "player of the year" is used. In Australia, Australian rules football clubs and leagues use the term "best and fairest", while those playing rugby league use "player of the year", such as the Dally M Medal. The National Basketball League, however, uses the American-style "MVP" for its awards. In many cases the awards are voted on by members of the media. In others the vote is by players, coaches, or umpires. In recent years, online polls from the public decide some awards. Sidney Gerald "Sid" Abel (February 22, 1918 – February 8, 2000) was a Canadian Hall of Fame hockey player, coach and general manager in the National Hockey League, most notably for the Detroit Red Wings, and was a member of three Stanley Cup-winning teams in 1943, 1950, and 1952. In 2017 Abel was named one of the '100 Greatest NHL Players' in history. Sidney Patrick Crosby (born August 7, 1987) is a Canadian professional ice hockey player who serves as captain of the Pittsburgh Penguins of the National Hockey League (NHL). Nicknamed "Sid the Kid" and dubbed "The Next One", Crosby was selected first overall by the Penguins in the 2005 NHL Entry Draft, and is widely regarded as one of the greatest hockey players of all time. Crosby debuted in the NHL during the 2005–06 season, recording 102 points and finishing as runner-up for the Calder Memorial Trophy as the NHL Rookie of the Year. By his second season, he led the NHL with 120 points to capture the Art Ross Trophy, becoming the youngest player and the only teenager to win a scoring title in any major North American sports league. That same season, Crosby won the Hart Memorial Trophy as the league's most valuable player (MVP) and the Lester B. Pearson Award for most outstanding player as judged by his peers. He started the 2007–08 season with the team's captaincy and subsequently led them to the 2008 Stanley Cup Finals, where they were defeated by the Detroit Red Wings in six games. The Penguins returned to the Finals against Detroit the following year and won in seven games; Crosby became the youngest captain in NHL history to win the Stanley Cup. In 2009–10, he received the Mark Messier Leadership Award and scored 51 goals, winning the Maurice Richard Trophy as the NHL's leading goal scorer. In early 2011, Crosby sustained a concussion that left him sidelined for the rest of the season and for most of the 2011–12 campaign. In 2014, Crosby again won the Hart Memorial Trophy as well as his second Art Ross Trophy (104 points) and his third Ted Lindsay Award. Crosby led Pittsburgh to Stanley Cup championships in 2016 and 2017, becoming the third player to win the Conn Smythe Trophy (playoff MVP) in consecutive years. In 2017, he also captured his second Richard Trophy and was named one of the 100 Greatest NHL Players in history. Internationally, Crosby has represented Canada on numerous occasions. He won gold at the 2005 World Junior Championships, and was later named to Team Canada for the 2010 Winter Olympics in Vancouver. Playing against the United States in the gold medal game, he scored the game-winning goal in overtime. Crosby captained Team Canada at the 2014 Winter Olympics, winning his second consecutive Olympic gold medal. A year later, he led his country to gold in the World Championship in Prague, thus becoming a member of the Triple Gold Club and the only player in the club to have captained all three winning teams. In 2016, Crosby captained Canada to gold in the World Cup of Hockey and was elected MVP by a unanimous vote. Stanley Mikita (born Stanislav Guoth; May 20, 1940 – August 7, 2018) was a Slovak-born Canadian professional ice hockey player for the Chicago Black Hawks of the National Hockey League, generally regarded as the best centre of the 1960s. In 2017, he was named one of the 100 Greatest NHL Players. Taylor Strba Hall (born November 14, 1991) is a Canadian professional ice hockey left winger who is currently an alternate captain for the New Jersey Devils of the National Hockey League (NHL). He was the first overall pick in the 2010 NHL Entry Draft selected by the Edmonton Oilers. As a first round draft pick for the Edmonton Oilers, Hall was named to the NHL All-Star Game in 2011, 2016, and 2018. In 2016, Hall was traded by the Oilers to the New Jersey Devils in a one for one trade for Adam Larsson. In his second season with the Devils, Hall won the Hart Memorial Trophy as the league's MVP, becoming the first Devils player in franchise history to win the award. The Ted Lindsay Award, formerly known as the Lester B. Pearson Award, is awarded annually to the National Hockey League's most outstanding player in the regular season as judged by the members of the NHL Players Association. First awarded in 1971, it is a companion to the Hart Memorial Trophy, which is awarded to the League's Most Valuable Player, as judged by members of the Professional Hockey Writers' Association. The award was renamed in 2010 after Ted Lindsay of the Detroit Red Wings.